The greatest contribution of India to the world is her material and spiritual science. No civilization, however old it be, has ever attained the level of sophistication, reached by the great ancient Siddhas, Yogis and Rishis of India in material and spiritual science. What they had was not just intelligence but intuition. They could see, hear or feel beyond the realm of the five senses. They did not need telescopes, microscope or other scientific equipments to unravel the mysteries of the cosmos. They only relied on the most powerful instrument in the world the human soul which has it in a latent sense, omniscience and omnipotence. The earth plane was actually designed as a laboratory for the evolution of souls, so the GOD send us His reprsentatives in the form of Siddhas, Yogis and Rishis to show us the way. This great souls are in every part of the world, but particularly in India and especially in Tamil Nadu, the land of the Mystics. In this Blog im Decoding the Hindu Sacred Stories, Symbols, Myth, Rituals and Worships for Today`s Modern World Scientifically. Many doubts such as the connection between the Universal Soul, the One God and myriad gods and goddesses, Hindu rituals, practices and their symbolism, the caste system and concepts such as karma, dharma and reincarnation are explained in a simplified and scientific form. "May Mother Earth and Father Heaven Bless You With Prosperity and Enlightenment"
Some of the following facts were recently published in a German magazine, which deals with WORLD HISTORY FACTS ABOUT INDIA and HINDUISM. - India invented the Number system 0 to 9. - The world's first University was established in Takshila in 700BC. More than 10,500 students from all over the world studied more than 60 subjects. The University of Nalanda built in the 4 th century BC was one of the greatest achievements of ancient India in the field of education. - Ayurveda is the earliest school of medicine known to humans. - Although western media portray modern images of India as poverty striken and underdeveloped through political corruption, India was once the richest empire on earth. - The art of navigation was born in the river Sindh 5000 years ago. The very word "Navigation" is derived from the Sanskrit word NAVGATIH. - The value of pi was first calculated by Budhayana, and he explained the concept of what is now known as the Pythagorean Theorem. British scholars have last year (1999) officially published that Budhayana's works dates to the 6th Century which is long before the European mathematicians. - Algebra, trigonometry and calculus came from India . Quadratic equations were by Sridharacharya in the 11 th Century; the largest numbers the Greeks and the Romans used were 106 whereas Indians used numbers as big as 1053. - USA based IEEE has proved what has been a century-old suspicion amongst academics that the pioneer of wireless communication was Professor Jagdeesh Bose and not Marconi. - Chess was invented in India . - Sushruta is the father of surgery. 2600 years ago he and health scientists of his time conducted surgeries like cesareans, cataract, fractures and urinary stones. Usage of anaesthesia was well known in ancient India . - When many cultures in the world were only nomadic forest dwellers over 5000 years ago, Indians established Harappan culture in Sindhu Valley ( Indus Valley Civilisation) . - The place value system, the decimal system was developed in India in 100 BC. India is the cradle of the human race, the birthplace of human speech, the mother of history, the grandmother of legend and the great grand mother of tradition. - Mark Twain. If there is one place on the face of earth where all dreams of living men have found a home from the very earliest days when man began the dream of existence, it is India . - French scholar Romain Rolland. Tantriga Jyotidam (Tantric Astrology) is an esoteric science practice by very few masters in India is a system designed by ancient Indian mystics. It is used to identify :- Soul's mission in this life - Spiritual secrets - Qualities, talents and capabilities of the individual - your hidden potential - your actual education, career & business path - How to appease Planets - How to get your departed ancestors blessings - Method to remove bad karmic energies that limit your potential - What you owe to society in your previous life and ways to pay the dues - How to turn your bad vibration or ill luck into positive vibration to attract health, wealth, prosperity - and many more…. The purpose of Astrology and Temple is to fix problems by focusing attention on rituals, worships and remedies. Unfortunately most people dont have such a fortunate life to learn about rituals, worships and remedies or have the grace and faith to believe in them. Remember rituals, worships and remedies in temples particularly in south Indian temples are nothing more or less then a advance technology to connect with divine beings. Divine help is available and we have ways to help you access the divine intervention in your life. "Know your astrology, rituals, worships, remedies and you begin to control your destiny"
'HOW TO KNOW GOD ? Education, which cannot give peace to the soul or cannot give the knowledge of the Self and the inner satisfaction, is not education. Education, which cannot wipe the tears of others, known or unknown, is not education. Education is understanding the situation - leading the life that can make the life, the Life Divine, where the ultimate goal of the life is the God-Realisation. During 2012, the Sun, Earth and Karthigai star, will be in alignment resulting in more of the grace light entering the Earth plane. Thereafter, it is predicted that the Karthigai - Lord Murugan energy will be responsible for the transformation of the planet and of the genetic evolution of the human species into Gods and Goddesses status. This energy will allow humans to return to their original blueprint. The most important thing to remember about these new energies is to stay conscious and match our frequency to receieve it through proper worships, rituals, yoga and mystical knowledge according to great siddha masters. The Siddhas were scientists, particularly in their investigations into chemistry, astronomy, plants, human anatomy and physiology. They applied their extraordinary powers, developed through intensive yogis practices, to research these areas on atomic and universal levels without the use of sophisticated equipment. In the long linege of Siddhas, one does not know when they came into earth's existance. Whether they still exist or are they Ascended masters teaching humanity the various sciences and philosophy, will perhaps, be never known. In the teachings of the Siddhas the human body is a temple of God. Man is a miniature representation of Paramatma or Supreme Intelligence. The purpose of life is to realize God.To manifest that realization in all planes of existence. Using special salts as well as herbal formulae the Siddhas developed the unique science of rejuvenation, known as "kaya kalpa", which allowed them to prolong their lives until the long term effects of Kriya Kundalini Pranayama and similar yogic practices could complete the process of transformation, bringing about physical immortality. Siddhas followed the ancient Guru- disciple apprenticeship method. They revealed their secrets to those students whom they felt could be trusted not to misuse the science. The science of Kaya kalpa was limited to those great sages. who were prepared for the uplifting of humanity. Ayurveda came much later as discipline. The Siddhas had vast knowledge of human anatomy. Their single-minded concentration was unique. It was was achieved with perfection. Their literature on medicine was extensive. The Siddhas were a close-knit community and preferred to preserve their knowledge. They reduced this knowledge to codes and symbols and their literature was steeped in mysticism. Only a Siddha can decode the writings of a Siddha. A beginner could not gain any appreciable knowledge without the Siddha accepting him as a student. Siddhas such as Thirumoolar, Agastyar, Boganathar, and many more had realized their capacity for experiencing and manifesting the Divine. This was not only limited to the spiritual plane of existence. The Cosmic Spirit would descend into the more lower and gross planes of consciousness, the intellectual, mental, and physical bodies. This for us is a limiting thought as our yogic parasites are not as intense as the Siddha. With progressive surrender of their being , their ego and their very lives the Divine would indeed transform them. With intense practices of various Kriyas, hatha and bhakti yoga, meditation, mantras and Kriya Kundalini Pranayama they merged with the Cosmic Spirit . This was race against time as the natural breakdown of cells, catabolism, had to be reversed to anabolism to prolong the extent of their age. They had to complete the Divine transformation. With Kriya Kundalini yoga and using specific herbal and mineral salts they were able to prolong their youth for the Ultimate transformation. The Universe was created out of a Cosmic Thought . No civilization be it the Inca, Atlantis or Egyptian had such a precise knowledge as the Siddhas. They were proficient in the science of longevity or deathless state, alchemy, medicine and physics. This blog is also intended to support my students by giving preview to, expansion on and follow-up to what we work in class. Suggestions and comments about the site are very welcome - mail to mailto:-templeofscience@yahoo.com. - Donation and Annadhanam at Old Folks Home in Klang on first weekend every month. - Mind Sound Yoga Class for standard 6 Tamil school students : 3 days in a week for free. - Monthly free Yoga and Hinduism class in Raja Rajeswary Temple at Hulu Klang, Ampang, Selangor and Ramalingeswarar Temple, Bangsar, K.L. .
Kubera, the Banker in Heaven, received his wealth on this day by worshipping Lord Shiva in Sivapuram Temple of South India. It is only on this day Lord Shiva blessed Lakshmi, the Goddess of Wealth, with all the riches. Thus, Lord Siva appointed both of them to their coveted positions as custodians of wealth and prosperity. 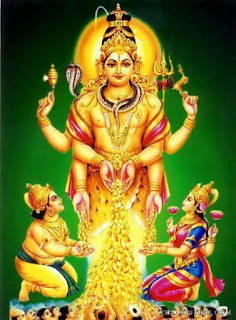 Akshaya Thritiyai is falling on the third day of the bright half of the lunar month of Chitirai of the traditional Hindu calendar, is one of the four most auspicious days of the year for Hindus. In 2018, the date of Akshaya Trithiyai is April 18th.The Sanskrit word 'Akshaya Thritiyai' means non-destroyable. Akshaya is the last year (60th) in the Tamil calendar and so the indication is that the end of calculation of years has not come and that the next cycle of 60 years will restart. The world is said to have brought into by Lord Brahmadeva in the month of Chitirai on suklapaksha thritiyai, the calendar year being Akshaya. This day of creation of the earth is considered as the non-destroyable (AKSHAYA) day, worthy of celebration with prayers to the Almighty and performance of pithru tharpanam to our departed forefather to seek their blessings. The word "Akshaya" means imperishable or eternal - that which never diminishes. Initiations made or valuables bought on this day are considered to bring success or good fortune. Generally people celebrate weddings, begin new business ventures, and even plan long journeys on this day. But as per divine rule the foremost important thing to understand is what you donate on this day will bless you to have that in abundance, in this birth and your next birth. Food, Clothes, Umbrellas, Shoes, Fruits, Buttermilk and Ghee will be distributed to the public on this day. You will be blessed with the educational excellence, promotions at work, courage, good karmic returns, freedom from physical distress and with longevity. Gold buying on Akshaya Trithiyai is a recent trend popularised by jewellery shops to make use of this important day to make money. I would like to say buying gold on Akshaya Thritiyai is good but it is just a non-essential practice but donating food for the needy and other donations for needy are the most essential. The day also marks the beginning of the "SatyaYugam" or the Golden Age - the first of the four Yugas. In the Puranas, the holy Hindu scriptures, there is a story that says that on this day of Akshaya Thritiyai, Veda Vyasa along with Ganesha started writing the great epic Mahabharata. Ganga Devi or Mother Ganges also descended on earth on this day. Akshayapatra meaning inexhaustible vessel, is an object from Hindu mythology. It was a wonderful vessel given to Yudhishthira by the Lord Surya, which held a never-failing supply of food to the Pandavas every day. When the Pandavas began their exile in the forest, Yudhishtra was despondent at his inability to feed the holy sages and others who accompanied him. At this, Dhaumya, the priest of the Pandavas, counselled him to pray to Lord Surya. Pleased with Yudhishtira's prayers, Lord Surya blessed him with the Akshaya Patra, a vessel that would give unlimited food every day till Draupadi finished eating. Lord Krishna also once partakes food from the Akshaya Patram, when sage Durvasa arrived at the Pandavas' place with his disciples. When Durvasa arrived, there was no food left to serve him, since Draupadi had already finished eating. The Pandavas became anxious as to what they would feed such a venerable sage. While Durvasa and his disciples were away at the banks of the river bathing, Draupadi prayed to Lord Krishna for help. As always, they were once again saved by Him, who partook of a single grain of rice from the Akshaya Patra and announced that He was satisfied by the meal. This satiated the hunger of Durvasa and all his disciples too, as the satisfaction of Lord Krishna meant the satiation of the hunger of the whole Universe. As per divine rule, what you donate on this day will bless you to have that in abundance, in your current and next birth. Food, Clothes, Umbrellas, Shoes, Fruits, Buttermilk and Ghee will be distributed to the public on this day. You will be blessed with the educational excellence, promotions at work, courage, good karmic returns, freedom from physical distress and with longevity. 8. Udakumbha Dhaanam - Giving water containing in bronze or silver vessel filling water with paccha karpooram and safron and Tulasi with betel nut and dakshanai. it gives Gaya Shradha phalam, its the most important daanam to be given for those who wants to get marry, who wants to getout of pithru shapams, and peoples who wants to have a child. Choose any dhaanam, or if possible give all the daanams and wash your bad karmas. What to do on Akshaya Thritiyai Day ? On Akshaya Thritiyai, one should worship the Goddess of Wealth, Lakshmi along with her consort Lord Vishnu. Akshaya here stands for the rice with which archana is performed. Akshaya Thritiyai day is widely celebrated in all parts of India by different sections of the society irrespective of their religious faith and social grouping. Donate food and clothes in plenty for needy on this day.. Even feeding ants, stray dogs, pigeon and planting sacred trees like neem etc., plants like jasmine etc. and herbs are very auspicious and will access the blessings of Goddess Lakshmy and Kuberan. The day is also considered auspicious for buying long term assets like gold and silver, including ornaments made of the same; diamond and other precious stones; and the real estate. The legend states that any venture initiated on the auspicious day of Akshaya Thritiyai shall continue to grow and bring prosperity. Hence, it is normal to see many of the new ventures, like starting a business, ground breaking for construction etc on the Akshaya Thritiyai Day. "May Goddess Lakshmi Bless You with Greater Health, Wealth and Prosperity"
I am looking for a good time for cesarean, as the Doctors have told we have to for a cesarean, on 6th May 2011. some people told at 11.30 A.M and some told at 12.15 PM, both come in karkataka lagna and there is Athiganda yougam in this lagna. Could any one suggest me how to proceed. If you are staying in Malaysia the good time is from 11am to 12pm for the cesarean. "May God bless your child with enlightenment"
Sir, I have thought both my daughters to allocate 10% of their saving for Charity. They have a small amount in their Piggy bank (special for Charity). Can you advise to whom they can give out on this Akshaya day? "The biggest Sin is being in Ignorance"
All kind of problems in human life are derived from the ignorance. You need to destroy your ignorance through the right knowledge if you want to be free from all of your problems. Remember, knowledge is your birthright and the real knowledge only comes from the heaven through Siddhas, Yogis and Rishis who has mastered the science and art to activate the whole brain and reach to Super Consciuos State to connect with cosmic intelligence,the Eternal Light of Spirit (God). How Rahu Ketu Transit from 18th August 2017 will Affect your Lives? Ancient India’s Contribution in Mathematics, Art, and Architecture. "It's great to see an online site that is giving real Hinduism teachings." Thanks for your email about Murungai, as we know already the goodness of the tree and eating its products, but the knowledge given by you makes us proud using it and make us in a position to explain scientifically to the children who refuse to eat these things. Plz continue educating us. Vanakam Mr Vijay, thank you for your great informative info on banana. Even tho as a general practioner i dont know much of diet info on general common foods .This helps me to spread the news to my patient too . Thank you again . I SIMPLY WANT TO SAY THANK YOU FOR PUTTING TOGETHER A COMPRHENSIVE AND WONDERFUL RESOURSE OF ALL ASPIRING SEEKERS OF TRUTH. I AM GRATEFUL TO YOU FOR YOUR WONDERFULLY RESEARHED, INSIGHTFUL ARTICLES ABOUT EVERYTHING AN INSPIRING SEEKER LIKE ME NEEDS TO KNOW. Dear Vijayakumar Allagappan , most appreciable work you have designed to bring the greatness of spirituality. I wish you will be succeed with your object by the help of cosmic energies. once again thanking you and all the team members. Astrology can Unlock your Hidden Potential so that you can be part of the 5% humanity who make it happen! Were the Devas stars, planets and other forces of nature? To understand this, we have to understand two words called, identification and personification. •Ancient Indians and many modern Indians too, believe, that the rivers, stars, planets, light, knowledge, books and everything else have a spirit and that, this spirit can take a human form (or any other form) at will. This is called personification. •Ancient Indians and many modern Indians too, also, identify human beings with forces of nature. If someone is brilliant and brave and handsome and generous, they would say, he is verily, the sun himself! This is identification. So a human could be identified with the Sun and called Surya Deva. There are four ways to purify and elevate the Athma (the human soul). The first is to concentrate one's mind through meditation. The second is to be always truthful. The third is to follow the path of learning. And the fourth is to keep chanting the name of Paramathma. The purpose of Temple and Astrology is to fix problems by focusing attention on worships and remedies. Unfortunately most people dont have such a fortunate life to learn about worships and remedies or have the grace and faith to believe in them. Remember rituals, worships and remedies of south Indian temples are nothing more or less then a technology to connect with divine beings. Divine help is available and we have ways to help you access divine intervention in your problems. You are the giant magnet that can attract positive and negative energy. Energize your body with positive energy and turn your auric field into negative energy so that your auric field will work as a shield of your body to attract positive things and repel negative things in your life. This technique is the greatest secret gift given by our siddhas to us for a successfull life with greater health, wealth, prosperity and enlightenment. Discover this secret in our special program, `Tantric Astrology` consultation. Every festival that is celebrated in HINDUISM condenses the vast knowledge of Astronomy, Ecology & Vaidya so as to adapt an individual to a particular climatic condition that is forth coming at a particular seasonal change. This is the immediate benefit to the individual. Most of the festive performances like doing yagnas, mixing turmeric and other stuff in rivers and lakes deals with the cleaning environment and retaining the environmental balance and the general health of the individual. This is the antharaartha of the festivals. All the festivals are synthesized from Puraannaas and these in turn represent the wisdom. From the planes of existence below Mahalokam, people need to be reincarnated on the Earth plane to settle their destiny and complete their give-and-take accounts. If one attains Mahalokam and Janalokam after death, that means they are above the spiritual level of 80%. These souls do not need to be reincarnated as all their remaining destiny (accumulated account) can be worked out from these planes itself. However these evolved subtle bodies may choose to be born of their own will. They do so primarily to act as spiritual guides for humanity. The Earth plane of existence is very important. It is the only plane of existence where we can make rapid spiritual growth and settle our give-and-take account in the shortest period of time. The main reason for this is that with the help of the physical body, we can do many things to enhance our spiritual growth and spiritual level and reduce the basic subtle tama component. Other than Earth, spiritual growth is mostly likely to occur only in the regions beyond Heaven such as Mahaalokam etc. This is because in Heaven, the subtle bodies run the risk of getting caught up in the unending pleasures it offers. In the Nether and Hell planes of existence, the punishment is so severe and also the distress from the other higher-level ghosts is such that it becomes very difficult to rise above the suffering to undertake any spiritual practice of value. The true Guru only comes to those who are blessed by God, and who are ready to recieve guidence with humility. Understand the rare gift it is to come into contact with such a pure Guru. Listen quietly and sincerely to the untainted words of such a genuine Guru and allow yourself to learn and absorb his teachings to you. Guruh-saakshaat parambrahma tasmai shrigurave namah"
1. India never invaded any country in her last 1000 years of history. 2. India invented the Number system 0 to 9. 3. The world's first University was established in Takshila in 700BC. More than 10,500 students from all over the world studied more than 60 subjects. The University of Nalanda built in the 4 th century BC was one of the greatest achievements of ancient India in the field of education. 4. Ayurveda is the earliest school of medicine known to humans. 5. Although western media portray modern images of India as poverty striken and underdeveloped through political corruption, India was once the richest empire on earth. 6. The art of navigation was born in the river Sindh 5000 years ago. The very word "Navigation" is derived from the Sanskrit word NAVGATIH. 7. The value of pi was first calculated by Budhayana, and he explained the concept of what is now known as the Pythagorean Theorem. British scholars have last year (1999) officially published that Budhayana's works dates to the 6th Century which is long before the European mathematicians. 8. Algebra, trigonometry and calculus came from India . Quadratic equations were by Sridharacharya in the 11 th Century; the largest numbers the Greeks and the Romans used were 106 whereas Indians used numbers as big as 1053. 9. According to the Gemmological Institute of America, up until 1896, India was the only source of diamonds to the world. 10. USA based IEEE has proved what has been a century-old suspicion amongst academics that the pioneer of wireless communication was Professor Jagdeesh Bose and not Marconi. 11. The earliest reservoir and dam for irrigation was built in Saurashtra. 12. Chess was invented in India . 13. Sushruta is the father of surgery. 2600 years ago he and health scientists of his time conducted surgeries like cesareans, cataract, fractures and urinary stones. Usage of anaesthesia was well known in ancient India . 14. When many cultures in the world were only nomadic forest dwellers over 5000 years ago, Indians established Harappan culture in Sindhu Valley ( Indus Valley Civilisation) . 15. The place value system, the decimal system was developed in India in 100 BC. ALL OF THE ABOVE IS JUST THE TIP OF THE ICEBERG, THE LIST COULD BE ENDLESS.